This flagstone path leads to Happy Valley, an area where summer homes have stood for many years. You can get to Karuizawa from Tokyo in a little more than an hour on the Nagano Shinkansen. The town, in eastern Nagano Prefecture, is now well known as an international summer resort. It is about 950 m above sea level, and the average temperature in mid-summer doesn't get above 25°C. Karuizawa is situated on a plateau at the base of the southeastern slope of Mount Asama, an awesome, active volcano. Summers are comfortably cool and Karuizawa is near Greater Tokyo, so when the heat hits the lowlands, people come here to stay in their summer homes, and tourists come in hordes. Karuizawa was located on the old Nakasendo, an important road that linked Edo (present-day Tokyo) to Kyoto. Travelers used to stop and stay the night there and this brought prosperity to the town, beginning in the 17th century. Later, with the development of rail transport in Japan, the inns lost their customers and the town was practically abandoned. A new period began when Alexander Croft Shaw, a British missionary born in Canada, visited and spent the whole summer there in 1887. Soon, the town was developing into a high-class resort for people wanting to escape the heat. The climate and natural beauty of the region attracted missionaries, diplomats and other Westerners, and many built vacation homes in the town. A railway line to Karuizawa was slow in coming, because of the steep mountain slopes, but track was finally laid through the Usui Pass and trains began arriving in 1893. This increased the number of summer visitors and led to the construction of new places to stay. In the early 1900s, many of Japan's influential politicians, financiers, authors and artists stayed here, making it a lively place for members of high society to meet one another. They settled in the district called Kyu (Old) Karuizawa, and built the first summer residences there. The district spreads out on the north side of JR Karuizawa Station, and still looks much as it did in the early 20th century, with its old churches and villas among woodlands of larch and fir trees. 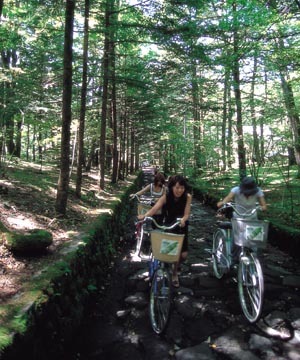 You might want to pedal through the district on a bicycle rented from a shop near the station or on Mikasa-dori Avenue, a road that leads to the Kyu-Karuizawa Rotary. There is a road that goes east from the avenue through a small forest. The road ends at the Manpei Hotel, opened in 1894 as a hotel for people from abroad. Ladies and gentlemen from polite society stayed there, and the hotel is now known as one of the finest in Karuizawa. Many authors, including the novelist and playwright Mishima Yukio, stayed there, developing a strong affinity for the town. The lobby and restaurant have a simple design, but the atmosphere is rich with history.